I went to the dentist yesterday and my mouth was a little sore, so what's a girl to do???? 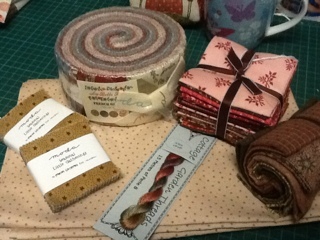 Why call into The Home Patch of course....nothing makes me feel better than a little wander around the store and a few purchases..... All to be put away as a reward for completing my UFOs, except for the La Belle Fleur jelly roll, which I need for a project. Pain has to eased and good health nurtured!! Purchases as good as those would make me feel better to. Enjoy. very pretty... I'msure they helped ease the pain!!! A little retail therapy at Annie's, beats getting a sticker for being a good girl!